Team Up & Take Them Down! Confrontations introduces Team vs. Team (2v2) play, as you choose a side an work with your teammate to win! Select your Super Hero (Superman, Wonder Woman, Aquaman, or Zatanna) or Super-Villain (Lex Luthor, Circe, Ocean Master, or Felix Faust) and join another player on your side for an epic clash against your two opponents. New Assist cards can be played during your teammate's turn so you can lend a hand. Each playable Super Hero and Super-Villain has three unique versions - when one is knocked down by the opposing team, you replace it with the next one, which has boosted abilities and is more difficult to defeat! 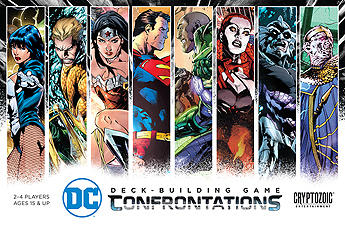 Though a standalone game, Confrontations can also be combined with any previous DC Deck-Building Game for an even bigger experience. Become a Super Hero or Super-Villain and confront your greatest foes! 2-player and 3-player variants included! Fully compatible with all Cerberus Engine: Heroes deck-building games.